Please feel free to create topics in this forum section regarding any questions you might have regarding Acronis Migrate Easy and Acronis Snap Deploy products. You can also leave your comments, feedback and suggestions regarding any Acronis products. If you have not found the answer there or you are using another Acronis product, first of all please make sure you use the the latest build of the appropriate version of the product. You can find the exact name and build number of the product in the Help -> About dialog. To get access to updates you should create an account first (if you haven't yet) and then register your copy of the product using "Product Registration" section of the account. After registration you will be able to log in on our site and download the latest build of the registered products using "Product Update" section. If you forget the password for your account please use this form. - carry out a clean installation of the latest build you have downloaded. If the problem persists with the latest build, please contact Acronis Customer Service Department and provide detailed description of the issue. Please note that contacting Acronis Customer Service Department is the most effective way to resolve your problems. Please include in your request for technical support the build number of the product, version of your operating system and Acronis Report file. 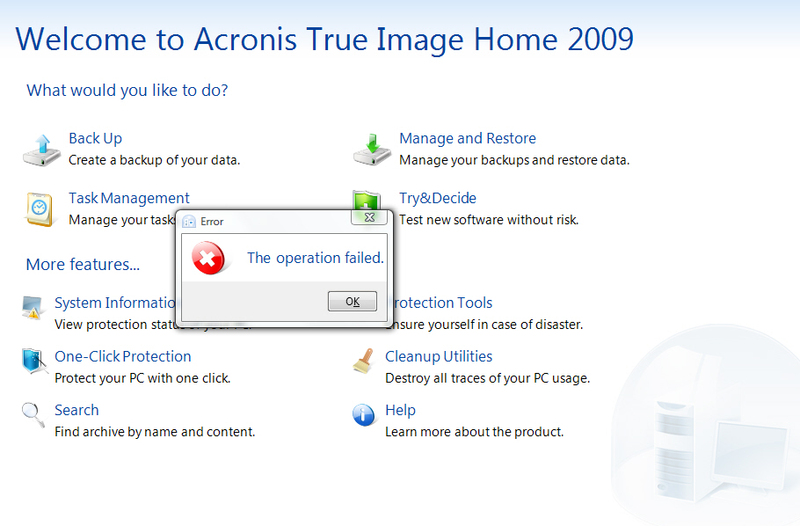 In order to create Acronis Report file, please download Acronis Report utility, run it and create a report. The default name of this file is "report.txt" and it is saved on your desktop. When trying to activate it again, this will not work. I recently installed True image 8 on XP PRO sp3 and tried to mount an old backup with "explore image" option. After executing this option I get the clock face "please wait". I've waited quite some time without a response. The system locks me out. I'm forced to hit reset. Can anything be done to mount some old backups. Are you able to use the mouning option, which I think is 'attach' in v8 instead of 'explore'? Do you use Windows Explorer or a 3rd party file manager? Are you using Windows and if so what version and build? Assuming Windows, has there been an update recently? Have you installed in new programs or any other programs updated themselves? If you open Windows Services (Windows button + r, type in services.msc) are the Acronis services running?